With 13 campuses across the province, more than 10,000 students and 100+ career-oriented programs, thousands of great careers start at NSCC each year. NSCC provides the most practical, hands-on education you can get in Nova Scotia. With instructors from industry, curriculum developed in cooperation with industry, small classes (typically 20-30 students), work terms and co-op placements, you'll find studying at NSCC is a real-world experience. At NSCC we're committed to student success, and that begins with helping ensure every student find the program that's right for them. Whether you’re interested in exploring Applied Arts & New Media, Business, Health & Human Services, or Trades & Technology, we can help. The Career in Gear website (careeringear.nscc.ca) is designed to help students understand their own strengths and preferences, and connect with a program that leads to a career they love. Test Drives can be arranged at all NSCC campuses, so you can check out the shops and labs and see for yourself what studying at NSCC is really like. There is also an Open House every Fall at all NSCC campuses – and you're definitely invited. Visit nscc.ca/OpenHouse to learn more. NSCC grads are work-ready, but you can also continue your education and build on what you've learned at NSCC. Formal agreements in place with other post-secondary institutions allow you to apply some NSCC credits toward a university degree. 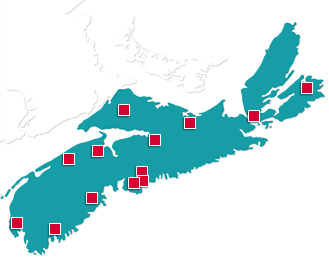 NSCC has 13 campuses and 3 Community Learning Centres in cities and towns across the province so it can bring the benefits of a career-oriented education to as many Nova Scotians as possible. The program mix changes from campus to campus, as each works to respond to the skilled workforce needs in its local market area.